Reserva los mejores vuelos de nuestras +197 rutas. Guarda tu información de contacto y de viajero para hacer cada compra más fácil y rápida. 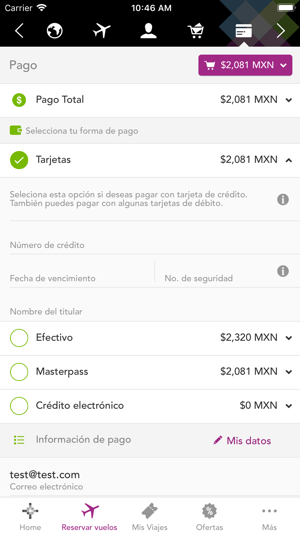 Guarda tus detalles de pago para hacer compras. Es fácil, rápido y seguro. Obtén acceso a nuestras promociones exclusivas para la app. ¡Y ahorra en tu próximo vuelo! Checa tus reservaciones, revisa detalles como nombre y vuelo, agrega servicios opcionales como equipaje, equipaje deportivo, prioridad de abordaje, asientos y más. Te hemos escuchado y check-in es más fácil. Completa los detalles de tu información de viajero, agrega servicios adicionales y obtén tu pase de abordad. Es así de fácil. Bríncate los kioskos y mostradores cuando viajas ligero. Puedes ver tu pase de abordar sin estar conectado a internet. ¡Únete a nuestra iniciativa paperless! 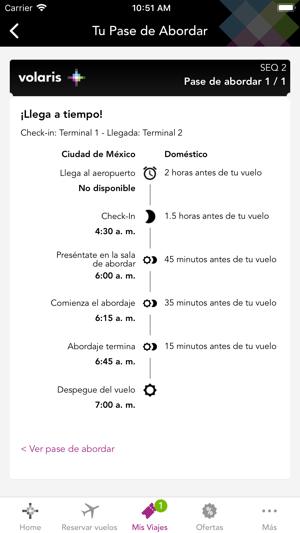 Checa la información de tu viaje: hora de abordaje, grupo de abordaje, asiento e itinerario. Para que llegues a tiempo al aeropuerto integramos una guía y mapas para encontrar la ruta más rápida. Obtén actualizaciones en tiempo real para información de salida y llegada a tu destino. 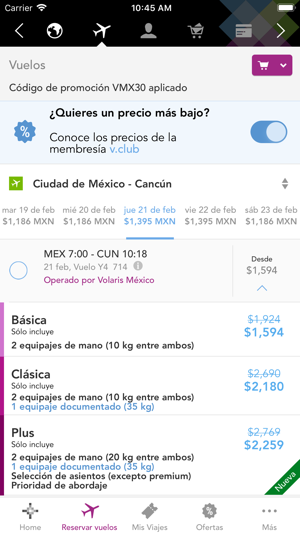 Te avisaremos cuando tengamos promociones, nuevos productos, cambio de políticas y nuevas funcionalidades en volaris.com. ¿Quieres obtener precios más baratos? Con la membresía v.club puedes obtener acceso a las tarifas más bajas, promociones exclusivas, y acceso antes que nadie para descuentos. Ingresa a tu cuenta y listo. 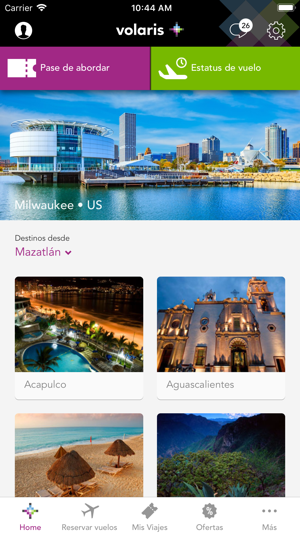 Envíanos tus comentarios y sugerencias a app@volaris.com. ¡Queremos escucharte! - Descubre nuestras nuevas opciones para viajar con los servicios que necesites y mayores beneficios Vclub. - ¡Ahora ya puedes escanear tu pasaporte y tarjeta de crédito para reservas más rápidas! - Recibe notificaciones push sobre el estatus de tu vuelo. Do not get the app!! Their service just keeps getting worse! 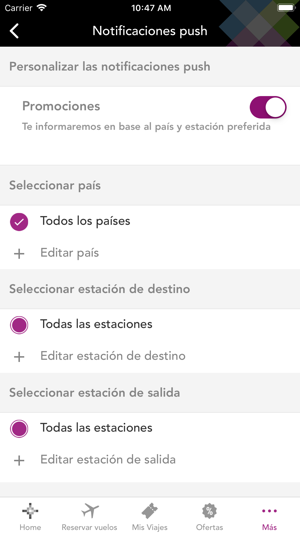 They push for you to get the app for easy check-in, however, a new policy came in (info given from a volaris representative) where the app will automatically assign you your seat. The problem is if you have a different reservation number then your partner or family members it will not allow you to sit next to them unless you pay a fee. It will assign you in the middle or the end of a row with random people and if you try to move up one row it will still charge you! Also, if you check-in as soon as it is open you will be automatically assigned to the last row and the system works it’s way up. Calling their customer service phone is a waste of time, they will NOT help. 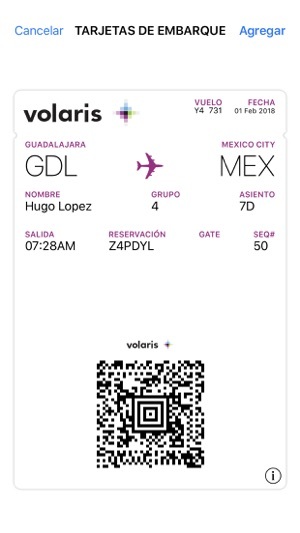 This last trip the app would not allow me to check-in everyone, there was a glitch and it only gave me 1 boarding pass out of 3, I called volaris and they asked me try online instead of the app. I listened and a system notification came up that said “please call our customer service for assistance” I read it to them and they told me to try again in a few hours and hung up. Lastly, the flight prices in the app are not the same as the website so make sure to check both, one may give you a cheaper price. First I was robbed from a seat I had paid online but was not given to me and was changed at the counter. Once boarded and being on the runway for over 35 minutes, the pilot announced that the aircraft had a computer issue that was going to be fixed in 15 minutes. Several hours later, we were still on the runway with the same issue and NO ONE giving us an explanation. I, along with other passengers, decided to get off the plane. NO ONE aided us with the process and refused to give us any refund or accommodations on another flight. I had to buy another ticket on another airline due to your non-compliance and lack of communication from your employees as to when the flight would leave and if the conditions to fly were optimal. The basic needs were not covered on the plane and there was not even water to use the restroom. This appears to be a usual practice of your airline. I expect a full refund of all the charges for this flight. I will also submit a complaint to the Federal Aviation Administration. This definitely was the trip of hell. I fly Volaris about a dozen times a year and I enjoy the flights, check ins, etc but I just wish they would hire some competent people to sift through their app and website and get out all the kinks. When I book I have to use the website to find my ticket, then go to the app to try to buy it but I typically can’t and have to call and they can’t help because I’m a VClub member. It’s a real hassle. The app worked great till about mid last year then it got all wonky. I use it to check in and for my boarding passes but just last week I tried to get an extra bag checked in for myself and my two kids. It would let me purchase extra bags for myself and my daughter but not my son. Don’t know why, but it’s those kinds of things that make me down grade it’s rating. Sometimes the price is different too on the app compared to the website - typically cheaper, so that’s good but why they can’t just figure it out is beyond me. I’ve been giving this feedback to them for several years and nothing’s changed - if anything, it’s gotten worse. Concesionaria Vuela Compania de Aviacion, S.A.P.I. de C.V.